Silent Process Exit – Is It Really? One of the new Windows 10 features visible to users is the support for additional “Desktops”. It’s now possible to create additional surfaces on which windows can be used. This idea is not new – it has been around in the Linux world for many years (e.g. KDE, Gnome), where users have 4 virtual desktops they can use. The idea is that to prevent clutter, one desktop can be used for web browsing, for example, and another desktop can be used for all dev work, and yet a third desktop could be used for all social / work apps (outlook, WhatsApp, Facebook, whatever). To create an additional virtual desktop on Windows 10, click on the Task View button on the task bar, and then click the “New Desktop” button marked with a plus sign. Now you can switch between desktops by clicking the appropriate desktop button and then launch apps as usual. It’s even possible (by clicking Task View again) to move windows from desktop to desktop, or to request that a window be visible on all desktops. The Sysinternals tools had a tool called “Desktops” for many years now. It too allows for creation of up to 4 desktops where applications can be launched. The question is – is this Desktops tool the same as the Windows 10 virtual desktops feature? Not quite. As can be seen in the diagram, a session contains a set of Window Stations. One window station can be interactive, meaning it can receive user input, and is always called winsta0. If there are other window stations, they are non-interactive. Each window station contains a set of desktops. Each of these desktops can hold windows. So at any given moment, an interactive user can interact with a single desktop under winsta0. Upon logging in, a desktop called “Default” is created and this is where all the normal windows appear. If you click Ctrl+Alt+Del for example, you’ll be transferred to another desktop, called “Winlogon”, that was created by the winlogon process. That’s why your normal windows “disappear” – you have been switched to another desktop where different windows may exist. This switching is done by a documented function – SwitchDesktop. In the Windows 10 virtual desktops feature, no new desktops are ever created. Win32k.sys just manipulates the visibility of windows and that’s it. Can you guess why? Why doesn’t Window 10 use the CreateDesktop/SwitchDesktop APIs for its virtual desktop feature? The reason has to do with some limitations that exist on desktop objects. For one, a window (technically a thread) that is bound to a desktop cannot be switched to another; in other words, there is no way to transfer a windows from one desktop to another. This is intentional, because desktops provide some protection. For example, hooks set with SetWindowsHookEx can only be set on the current desktop, so cannot affect other windows in other desktops. The Winlogon desktop, as another example, has a strict security descriptor that prevents non system-level users from accessing that desktop. Otherwise, that desktop could have been tampered with. The virtual desktops in Windows 10 is not intended for security purposes, but for flexibility and convenience (security always “contradicts” convenience). That’s why it’s possible to move windows between desktops, because there is no real “moving” going on at all. From the kernel’s perspective, everything is still on the same “Default” desktop. The next public remote Windows kernel Programming class I will be delivering is scheduled for April 15 to 18. It’s going to be very similar to the first one I did at the end of January (with some slight modifications and additions). I have not yet finalized the time zone the class will be “targeting”. I will update in a few weeks on that. If you’re interested in registering, please email zodiacon@live.com with the subject “Windows Kernel Programming class” and specify your name, company (if any) and time zone. I’ll reply by providing more information. Feel free to contact me for questions using the email or through twitter (@zodiacon). The cyber security industry has grown considerably in recent years, with more sophisticated attacks and consequently more defenders. To have a fighting chance against these kinds of attacks, kernel mode drivers must be employed, where nothing (at least nothing from user mode) can escape their eyes. The course provides the foundations for the most common software device drivers that are useful not just in cyber security, but also other scenarios, where monitoring and sometimes prevention of operations is required. Participants will write real device drivers with useful features they can then modify and adapt to their particular needs. AppContainers are the sanboxes typically used to run UWP processes (also known as metro, store, modern…). A process within an AppContainer runs with an Integrity Level of low, which effectively means it has no access to almost everything, as the default integrity level of objects (such as files) is Medium. This means code running inside an AppContainer can’t do any sigtnificant damage because of that lack of access. Furthermore, from an Object Manager perspective, named objects created by an AppContainer are stored under its own object manager directory, based on an identifier known as AppContainer SID. This means one AppContainer cannot interfere with another’s objects. For example, if a process not in an AppContainer creates a mutex named “abc”, its full name is really “\Sessions\1\BaseNamedObjects\abc” (assuming the process runs in session 1). On the other hand, if AppContainer A creates a mutex named “abc”, its full name is something like “\Sessions\1\AppContainerNamedObjects\S-1-15-2-466767348-3739614953-2700836392-1801644223-4227750657-1087833535-2488631167\abc”, meaning it can nevr interfere with another AppContainer or any process running outside of an AppContainer. Although AppContainers were created specifically for store apps, theye can also be used to execute “normal” applications, providing the same level of security and isolation. Let’s see how to do that. First, we need to create the AppContainer and obtain an AppContainer SID. This SID is based on a hash of the container name. In the UWP world, this name is made up of the application package and the 13 digits of the signer’s hash. For normal applications, we can select any string; selecting the same string would yield the same SID – which means we can actually use it to “bundle” several processes into the same AppContainer. “AppContainer” in Process Explorer implies Low integirty level. 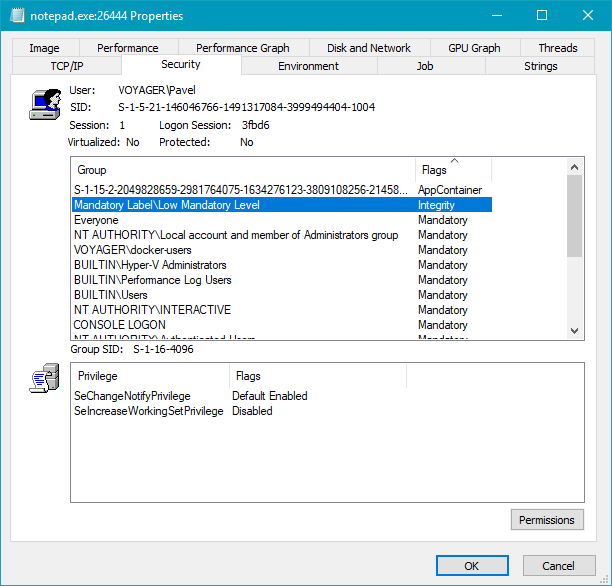 If we would want Notepad to have access to the user’s files, such as documents and pictures, we would have to set explict permissions on these objects allowing access to the AppContainer SID. Functions to use include SetNamedSecurityInfo (see the project on Github for the full code). Let’s now try a more interesting application – Windows Media Player (yes, I know, who uses the old Media Player these days? But it’s an interesting example). Windows Media Player has the (annoying?) feature where you can only run a single instance of it at any given time. The way this works is that WMP creates a mutex with a very specific name, “Microsoft_WMP_70_CheckForOtherInstanceMutex“, if it already exists, it sends a message to its buddy (a previous instance of WMP) and then terminates. 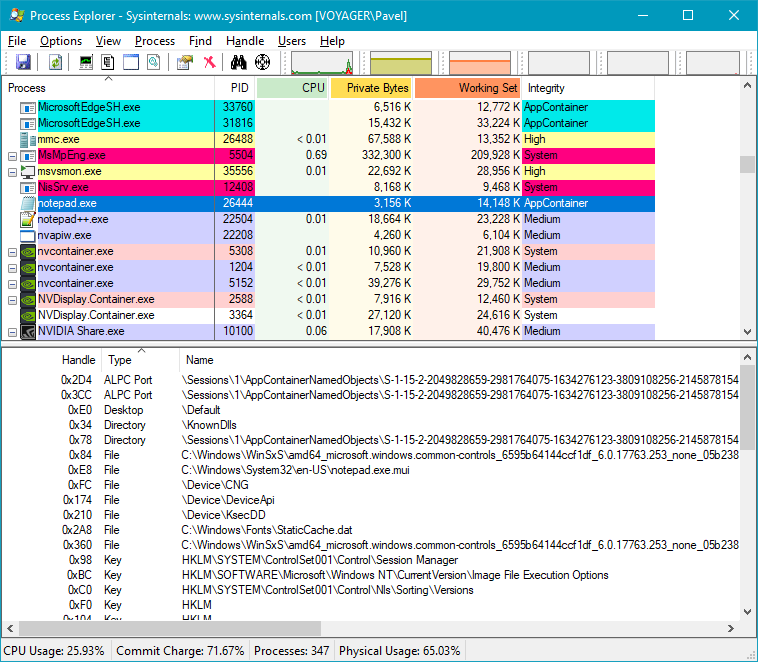 A simple trick we can do with Process Explorer is to close that handle and then launching another WMP. Let’s try something different: let’s run WMP in an AppContainer. Then let’s run another one in a different AppContainer. Will we get two instances? Running WMP in this way popus up its helper, setup_wm.exe which asks for the initial settings for WMP. Clicking “Express Settings” closes the dialog but it then it comes up again! And again! You can’t get rid of it, unless you close the dialog and then WMP does not launch. Can you guess why is that? The code can be found at https://github.com/zodiacon/RunAppContainer. After a short twitter questionaire, I’m excited to announce a Remote Windows Kernel Programming class to be scheduled for the end of January 2019 (28 to 31). If you want to learn how to write software drivers for Windows (not hardware, plug & play drivers), including file system mini filters – this is the class for you! You should be comfortable with programming on Windows in user mode (although we’ll discuss some of the finer points of working with the Windows API) and have a basic understanding of Windows OS concepts such as processes, threads and virtual memory. If you’re interested, send an email to zodiacon@live.com with the title “Windows Kernel Programming Training” with your name, company name (if any), and time zone. I will reply with further details. While working on my GflagsX tool, there was yet another feature the tool was missing compared to the classic GFlags tool – Silent Process Exit support. But what is Silent Process Exit? Self exiting – one of the threads in the process calls ExitProcess. A TerminateProcess call is issued from another (or the same process). The documentation states that if a process exits because all threads terminate normally, then Silent Process Exit is not in effect. (also if kernel code kills a process, Silent Process Exit is not invoked). The documentation may lead us to belive that if a process exits normally (no abnormal termination or exception) then Silent Process Exit will not be invoked. Let’s test that theory. Click Apply to apply the settings. Now launch Notepad. If you terminate it using (say) Task Manager, you’ll find a subfolder under the configured Dump Folder Location named Notepad.exe-(PID xxxx)-yyyyyyyy where xxxx is the terminating process ID and yyyyyy is the value returned from GetTickCount at the time of the exit (the number of milliseconds elapsed since Windows booted). Inside the folder you’ll find the dump file itself. However, if you launch notepad again and just close its main window, you’ll find, perhaps surprisingly, that yet another folder was created with a new dump file. But why? Isn’t this a normal process termination? Since we can be pretty sure no process (including notepad) called TerminateProcess, this means notepad called ExitProcess. Is this “normal”? Are there processes that terminate by just ending all their threads? Now it seems clear: when the first (“main”) thread of notepad returns from its main function, the C-runtime library calls ExitProcess explicitly. And in fact this is what you’ll find with most executables. This is why when the main thread exits in a C/C++ application, the process ends wven if other threads still exist and executing. From the Windows kernel’s perspective, there is no “main” thread – all threads are equal. Stay tuned for more info on Silent Process Exit support in GFlagsX! Posted on September 21, 2018 September 21, 2018 Categories Debugging, DEV, Windows InternalsTags WindowsInternals, DEVLeave a comment on Silent Process Exit – Is It Really?